Liuz Siujboh (Sawgun:刘晓波, seng youq 1955 nienz 12 nyied 28 hauh), Cunghgoz vwnzyoz bihbingzgya, cozgya, gyausou caeuq yinzgienz hozdunggya, de ngawz Cunghgoz cwngci gaijgwz caueq Cunghgung duzcaiz roengzmuq. Seizneix de youq guh bouxfamh cwngci. Liuz Siujboh youq 2003 nienz daengj 2007 nienz dang Duzliz cunghvwnz bizvei cujsiz. Coengz cungh 1990 nienzdaih haihij, de lij dwg Minzcuj cunghgoz cabceiq cungjbien. 2008 nienz 12 nyied 8 hauh, Liuz Siujboh aen'vih canhgya ciemdingh 08 yencangh gwn laengz. 2009 nienz 6 nyied 23 hauh gwn gaemh, coihmingz dwg yoekfeiz diemhfuz guekgya cingqcienz. dingh hingz 8 nienz. 2010 nienz de aen'vih feibauhlig gangcwngh ndaej Nobel hozbingz ciengj. Liu was born in Changchun, Jilin, in 1955 to an intellectual family. In 1969, during the Down to the Countryside Movement, Liu's father took him to Horqin Right Front Banner, Inner Mongolia. After he finished middle school in 1974, he was sent to the countryside to work on a farm in Jilin. In 1977, Liu was admitted to the Department of Chinese Literature at Jilin University, where he created a poetry group known as "The Innocent Hearts" (Chi Zi Xin) with six schoolmates. In 1982, he graduated with B.A. in literature before being admitted as a research student at the Department of Chinese Literature at Beijing Normal University. In 1984, he received an M.A. in literature and became a teacher at the same department. That year, he married Tao Li, with whom he had a son named Liu Tao in 1985. In 1986, Liu started his doctoral study program and published his literary critiques at various magazines. He became well known as a "dark horse" for his radical opinions and sharp comments on the official doctrines and establishments to shock both of the literary and ideological circles, thus termed as "Liu Xiaobo Shock" or "Liu Xiaobo Phenomenon". In 1987, his first book, Criticism of the Choice: Dialogues with Li Zehou, was published and became a bestseller non-fiction. It comprehensively criticised the Chinese tradition of Confucianism and posed a frank challenge to Li Zehou, a rising ideological star who had a strong influence on young intellectuals in China at the time. "[It would take] 300 years of colonialism. In 100 years of colonialism, Hong Kong has changed to what we see today. With China being so big, of course it would require 300 years as a colony for it to be able to transform into how Hong Kong is today. I have my doubts as to whether 300 years would be enough." Liu admitted in 2006 that the response was extemporaneous, although he did not intend to take it back, as it represented "an extreme expression of his longheld belief." The quote was nonetheless used against him. He has commented, "Even today [in 2006], radical patriotic 'angry youth' still frequently use these words to paint me with 'treason'." During the 1989 Tiananmen Square protests, he was in the United States but decided to return to China to join the movement. He was later named as one of the "four junzis of Tiananmen Square" for persuading students to leave the square and thus saving hundreds of lives. In his 1996 article titled "Lessons from the Cold War", Liu argues that "The free world led by the US fought almost all regimes that trampled on human rights … The major wars that the US became involved in are all ethically defensible." He has defended U.S. policies in the Israeli–Palestinian conflict, which he thinks is the fault of the "provocateur" Palestinians. Liu also published a 2004 article in support of Bush's war on Iraq, titled "Victory to the Anglo-American Freedom Alliance", in which he praised the U.S.-led post-Cold War conflicts as "best examples of how war should be conducted in a modern civilization." He predicted "a free, democratic and peaceful Iraq will emerge." During the 2004 US presidential election, Liu again praised Bush for his war effort against Iraq and condemned Democratic Party candidate John Kerry for not sufficiently supporting the wars in which the U.S. was then involved. He commented on Islamism that, "a cul­ture and (reli­gious) sys­tem that pro­duced this kind of threat (Islamic fundamentalism), must be extremely intol­er­ant and blood-thirsty." On Israel, he said "with­out America’s pro­tec­tion, the long per­se­cuted Jews who faced exter­mi­na­tion dur­ing World War II, prob­a­bly would again be drowned by the Islamic world's hatred." On 27 April 1989, Liu returned to Beijing and immediately and actively supported the popular movement. When the army looked set violently eject from Tiananmen Square the students who persistently occupied the Square to challenge the government and army enforcing the martial law, he initiated a four-man three-day hunger strike on 2 June. Later referred to as the "Tiananmen Four Gentlemen Hunger Strike", the action was to earn the trust from the students. He requested that the government and the students abandon the ideology of class struggle and to adopt a new kind of political culture for dialogue and compromise. Although it was too late to prevent the massacre from occurring beyond the Square starting from the night of 3 June, he and his colleagues successfully negotiated with the student leaders and the army commander to let all the several thousand students withdraw peacefully from the Square, thus avoiding a possible bloodshed in a much larger scale. On 6 June, Liu was arrested and detained in Qincheng Prison for his alleged role in the movement, and three months later was expelled from the Beijing Normal University. The government's media issued numerous publications which labelled him a "mad dog" and "black hand" because he had allegedly incited and manipulated the student movement to overthrow the government and socialists. His publications were banned, including his fourth book in press, Going Naked Toward God. In Taiwan however, his first and third books were republished with some additions as Criticism of the Choice: Dialogues with Leading Thinker LI Zehou (1989), and the two-volume Mysteries of Thought and Dreams of Mankind (1990). In January 1991, 19 months since his arrest, Liu Xiaobo was convicted on the offence of "counter-revolutionary propaganda and incitement" but exempted from criminal punishment for his "major meritorious action" for having avoided the possibly bloody confrontation at Tiananmen Square. After his release, he was divorced and eventually his ex-wife and son immigrated to the US. He resumed his writing, mostly on human rights and political issues though he has not been allowed to publish in Mainland China. In 1992, he published in Taiwan his first book after his imprisonment, The Monologues of a Doomsday’s Survivor, a controversial memoir with his confessions and political criticism on the popular movement in 1989. In January 1993, Liu was invited to visit Australia and the US for the interviews in the documentary film Gate of Heavenly Peace. Although many of his friends suggested that he take refuge abroad, Liu returned China in May 1993 and continued his freelance writing. On 18 May 1995, the police took Liu into custody for launching a petition campaign on the eve of the sixth anniversary of June 4 massacre, calling on the government to reassess the event and to initiate political reform. He was held under residential surveillance in the suburbs of Beijing for 9 months. He was released in February 1996 but arrested again on 8 October for an October Tenth Declaration, co-authored by him and another prominent dissident Wang Xizhe, mainly on Taiwan issue that advocated the peaceful unification to oppose Chinese Communist Party's forceful treats toward the island. He was ordered to serve three years of re-education through labor on "disturbing public order” for that statement. In the same year, he married Liu Xia. After his release on 7 October 1999, Liu Xiaobo resumed his freelance writing. However, it is reported that the government built a sentry station next to his home and his phone calls and internet connections were tapped. In 2000, he published in Taiwan A Nation That Lies to Conscience, a 400-paged political criticism. Also published, in Hong Kong, was Selection of Poems, a 450-paged collection of the poems as correspondences between him and his wife during his imprisonment; it was co-authored by Liu and his wife. The last of three books which he published during the year was in Mainland China, titled The Beauty Offers Me Drug: Literary Dialogues between Wang Shuo and Lao Xia, a 250-paged collection of literary critiques co-authored by a popular young writer and by himself under his unknown penname of "Lao Xiao". In the same year, Liu participated in founding the Independent Chinese PEN Centre and was elected to its board of directors as well as its president in November 2003, re-elected two years later. In 2007, he did not seek for the re-election of the president but hold his position of the board member until detained by the police in December 2008. In 2004, when he started to write a Human Rights Report of China at home, his computer, letters and documents were confiscated by the government. He once said, "at Liu Xia's [Liu's wife] birthday, her best friend brought two bottles of wine to [my home] but was blocked by the police from coming in. I ordered a [birthday] cake and the police also rejected the man who delivered the cake to us. I quarreled with them and the police said, "it is for the sake of your security. It has happened many bomb attacks in these days." Those measures were loosened until 2007, prior to the 2008 Beijing Olympic Games. In January 2005, following the death of former Chinese Premier Zhao Ziyang, who showed sympathy to protesters of the student demonstration in 1989, Liu was immediately put under house arrest for two weeks before realizing the death of Zhao. In the same year, he published two more books in the US, Future of Free China Exists in Civil Society, and Single-Blade Poisonous Sword: Criticism of Chinese Nationalism. His writing is considered subversive by the Chinese Communist Party, and his name is censored. He has called for multi-party elections, free markets, advocated values of freedom, supported separation of powers and urged the governments to be accountable for its wrongdoings. When not in prison, he has been the subject of government monitoring and put under house arrest during sensitive times. Liu's human rights work has received international recognition. In 2004, Reporters Without Borders awarded him the Fondation de France Prize as a defender of press freedom. June 1989 – January 1991 Charged with spreading messages to instigate counterrevolutionary behavior. Imprisoned in one of China's best-known maximum security prisons, Qincheng Prison, and discharged when he signed a "letter of repentance." May 1995 – January 1996 Being involved in democracy and human rights movement and voicing publicly the need to redress government's wrongdoings in the student protest of 1989 Released after being jailed for six months. October 1996 – October 1999 Charged with disturbing the social order Jailed in a labor education camp for three years. In 1996, he married Liu Xia. December 2009 – 2020 Charged with spreading a message to subvert the country and authority Sentenced for 11 years and deprived of all political rights for two years. Currently imprisoned in Jinzhou Prison in Liaoning Province. Liu Xiaobo actively participated in the writing of and, along with more than three hundred Chinese citizens, signed Charter 08. The Charter is a manifesto released on 10 December 2008 to coincide with the 60th anniversary of the adoption of the Universal Declaration of Human Rights. It was written in the style of the Czechoslovak Charter 77, calling for more freedom of expression, human rights, more democratic elections, for privatizing state enterprises and land and for economic liberalism. As of September 2010, the Charter has collected over 10,000 signatures. Two days before the official release of the Charter, late in the evening of 8 December 2008, Liu was taken into custody by the police, as was Zhang Zuhua, another scholar and Charter 08 signatory. According to Zhang, the two were detained on suspicion of gathering signatures to the Charter. While Liu was detained in solitary confinement, he was forbidden to meet with his lawyer or family, though he was allowed to eat lunch with his wife, Liu Xia, and two policemen on New Year's Day 2009. On 23 June 2009, the Beijing procuratorate approved Liu's arrest on charges of "suspicion of inciting subversion of state power," a crime under Article 105 of China's Criminal Law. In a Xinhua news release announcing Liu's arrest, the Beijing Public Security Bureau alleged that Liu had incited the subversion of state power and the overturn of the socialist system through methods such as spreading rumors and slander, citing almost verbatim Article 105; the Beijing PSB also noted that Liu had "fully confessed." This statement, titled "I have no enemies", was later read in the 2010 Nobel Peace Prize ceremony, which Liu was unable to attend due to imprisonment. On 25 December 2009, Liu was sentenced to eleven years' imprisonment and two years' deprivation of political rights by the Beijing No. 2 Intermediate Court on charges of "inciting subversion of state power." According to Liu's family and counsel, he plans to appeal the judgment. In the verdict, Charter 08 was named as part of the evidence supporting his conviction. John Pomfret of The Washington Post said Christmas Day was chosen to dump the news because the Chinese government believed Westerners were less likely to take notice on a holiday. 模板:CquoteIn an article published in the South China Morning Post, Liu argued that his verdict violated China's constitution, and the Universal Declaration of Human Rights of the United Nations. He argued that charges against him of 'spreading rumours, slandering and in other ways inciting the subversion of the government and overturning the socialist system' were contrived, as he did not fabricate or create false information, nor did he besmirch the good name and character of others by merely expressing a point of view, a value judgment. In December 2009, the European Union and United States issued formal appeals calling for the unconditional release of Liu Xiaobo. China, responding to the international calls prior to the verdict, stated that other nations should "respect China's judicial sovereignty and to not do things that will interfere in China's internal affairs." Responding to the verdict, United Nations Human Rights Commissioner Navanethem Pillay expressed concern at the deterioration of political rights in China. German Chancellor Angela Merkel strongly criticized the verdict, stating "despite the great progress in other areas in the expression of views, I regret that the Chinese government still massively restricts press freedom." Canada and Switzerland also condemned the verdict. The Republic of China President Ma Ying-jeou called on Beijing to "tolerate dissent". On 6 January 2010, former Czech president Václav Havel joined with other communist-era dissidents at the Chinese Embassy in Prague to present a petition calling for Liu's release. On 22 January 2010, European Association for Chinese Studies sent an open letter to Hu Jintao on behalf of over 800 scholars from 36 countries calling for Liu's release. On 6 October 2010, the non-governmental organization Freedom Now, which serves as an international counsel to Liu Xiaobo as retained by his family, publicly released a letter from 30 members of the U.S. Congress to President Barack Obama, urging him to directly raise both Liu's case and that of fellow imprisoned dissident Gao Zhisheng to Chinese President Hu Jintao at the G-20 Summit in November 2010. The Republic of China President Ma Ying-jiu congratulated Liu on winning the Nobel Prize and requested Chinese authorities to improve their impression to the world about human rights, but not calling for his release from prison. In 2011, the WorldWideReading is dedicated to Liu Xiaobo; on March 20, there were readings in more than 60 towns and cities on all continents and broadcast via radio stations. The appeal "Freedom for Liu Xiaobo" has so far been supported by more than 700 writers from around the world, amongst them the Nobel Prize laureates John M. Coetzee, Nadine Gordimer, Herta Müller and Elfriede Jelinek, as well as Breyten Breytenbach, Eliot Weinberger, Salman Rushdie, Vikram Seth, Mario Vargas Llosa, Wolf Biermann and Dave Eggers. 模板:Main On 8 October 2010, the Nobel Committee awarded Liu the Nobel Peace Prize "for his long and non-violent struggle for fundamental human rights in China," saying that Liu had long been front-runner as the recipient of the prize. China reacted negatively to the award, immediately censoring news about the announcement of the award in China, though later that day became available.模板:Clarify Foreign news broadcasters including CNN and the BBC were immediately blocked, while heavy censorship was applied to personal communications. The Chinese Foreign Ministry denounced the award to Liu Xiaobo, saying that it "runs completely counter to the principle of the award and is also a desecration of the Peace Prize." The Norwegian ambassador to the People's Republic of China was summoned by the Foreign Ministry on 8 October 2010 and was presented with an official complaint about the granting of the Nobel Peace Prize to Liu. The Chinese government has called Liu Xiaobo a criminal and stated that he does not deserve the prize. Chinese dissident Wei Jingsheng criticized Liu by calling him "the accomplice of the Communist regime." Following the announcement of the Nobel Peace Prize, celebrations in China were either stopped or curtailed, and prominent intellectuals and other dissidents were detained, harassed or put under surveillance; Liu's wife, Liu Xia, was placed under house arrest, and was forbidden to talk to reporters even though no official charges were brought. Sixty-five countries with missions in Norway were all invited to the Nobel Prize ceremony, but fifteen declined, in some cases due to heavy lobbying by China. Besides China, these countries were Russia, Kazakhstan, Tunisia, Saudi Arabia, Pakistan, Iraq, Iran, Vietnam, Venezuela, Egypt, Sudan, Cuba and Morocco. China also imposed travel restrictions on known dissidents ahead of the ceremony. A Chinese group announced that its answer to the Nobel Peace Prize, the Confucius Peace Prize, would be awarded to former Taiwan Vice-President Lien Chan for the bridge of peace he has been building between Taiwan and Mainland China. Lien Chan himself denied any knowledge of the $15,000 prize. Honorary member of German, American, Portuguese, Czech and Sydney PEN Centers, and Honorary President of Independent Chinese PEN Centre. ↑ "Verdict Against Liu Xiaobo". International PEN. Retrieved 11 January 2012. ↑ "NED Extends Its Warmest Congratulations to Grantee Liu Xiaobo on Receiving the Nobel Peace Prize," National Endowment for Democracy. 8 October 2010. ↑ 6.0 6.1 6.2 6.3 6.4 Beijing No. 1 Intermediate Court, Criminal Verdict no. (2009) yi zhong xing chu zi 3901, unofficial English translation in Human Rights in China, "International Community Speaks Out on Liu Xiaobo Verdict," 30 December 2009. ↑ Dwyer Arce (December 10, 2010). "China dissident Liu Xiaobo awarded Nobel Peace Prize in absentia". JURIST - Paper Chase. ↑ "赤子心诗社". Baidu. 22 April 2009. ↑ Liu Xiaobo, "文壇「黑馬」劉曉波模板:Dead link" (Liu Xiaobo, the "Dark Horse" of Literature), Open Magazine, 27 November 1988. ↑ 18.0 18.1 18.2 Liu Xiaobo, "我與《開放》結緣十九年模板:Dead link" (My 19 Years of Ties with "Open Magazine"), Open Magazine, 19 December 2006. ↑ Liberty Monthly, December 1988. ↑ 21.0 21.1 Sautman, Barry; Yan, Hairong (15 December 2010). "Do supporters of Nobel winner Liu Xiaobo really know what he stands for?". The Guardian. Retrieved 3 November 2011. ↑ Liu Xiaobo, "刘晓波：美英自由联盟必胜" (Liu Xiaobo: Victory to the Anglo-American Freedom Alliance), Epoch Times, 13 April 2004. ↑ Liu Xiaobo, "伊战与美国大选模板:Dead link" (The Iraq War and the US Presidential Election), Independent Chinese PEN Center, 13 October 2004. ↑ Liu Xiaobo, "劉曉波：勞教 早該被廢除的惡法" (Reeducation-through-labor: An evil law which should be quickly repealed), Observe China, 6 December 2007. ↑ 26.0 26.1 26.2 26.3 警車守門外多年被軟禁, 9 October 2010, Apple Daily (Hong Kong). ↑ Baculinao, Eric and Gu, Bo (8 October 2010)In China, citizens find ways to learn of Nobel prize, NBC News. ↑ 和平獎得主劉曉波小傳, Hong Kong Mingpao. ↑ "China Detains Dissidents ahead of Human Rights Day," Reuters, 9 December 2008; "Report: Chinese Police Detain Political Critic," Associated Press, 9 December 2008. 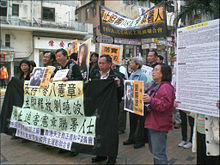 ↑ 39.0 39.1 "Writers Call for China Dissident's Release," Reuters, 9 December 2008. ↑ Cara Anna, "Diplomats Kept Away from China Dissident's Trial模板:Dead link," The Associated Press, 23 December 2009. ↑ Pomfret, John (8 October 2010). China's Liu Xiaobo wins Nobel Peace Prize模板:Dead link, Washington Post; pub:AARP. ↑ Liu Xiaobo (9 February 2010) Guilty of 'crime of speaking', South China Morning Post. ↑ 64.0 64.1 "Petition Urges Nobel for Jailed Chinese Writer" article by Andrew Jacobs in The New York Times 25 September 2010. Retrieved 25 September 2010. ↑ "Taiwan's Ma congratulates Nobel laureate Liu"模板:Dead link. The Associated Press. 9 October 2010. ↑ "The Nobel Peace Prize 2010". Nobelprize.org. Retrieved 8 October 2010. ↑ Eric Baculinao and Bo Gu, "In China, citizens find ways to learn of Nobel prize", NBC News, 8 October 2010. ↑ "外交部发言人马朝旭答记者问". Ministry of Foreign Affairs of the People's Republic of China. 8 October 2010. Retrieved 8 October 2010. ↑ One World Homo Homini award goes to Chinese dissident，2009年3月12日. ↑ Liu Xiaobo De-World, 7 October 2010. Jailed Chinese Dissident Liu Xiaobo Awarded Nobel Peace Prize - video report by Democracy Now!